When deciding on what material to choose for your roof, an option that is becoming more and more popular are tiles. With their attractive appearance and flair, it’s no wonder more and more homeowners are leaning towards tiles. 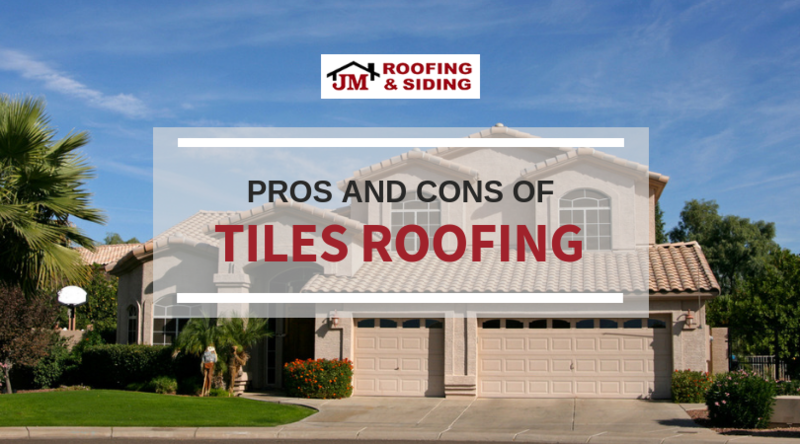 However, no roofing material is perfect, so before you invest in them, it’s wise to know the pros and cons of tile roofing. This is one of the best perks of tile roofing. When used in the right climate and installed properly, tile can last for decades, sometimes even over a hundred years. Oftentimes, tile roofing with be the only roof you’ll have to buy in your lifetime for that house. While asphalt shingles are made using non-organic compounds, tiles are made using organic, Earth materials, such as concrete or terra cotta. When they need to be replaced, the tiles are able to be recycled without harming our planet. Since it’s so durable, tile roofing requires little to no regular maintenance, making them a solid investment. Tile roofs can cost a lot more than shingle roofs. While they do last longer and you won’t have to replace them as much, you’ll pay more upfront for tiles. Before setting your sights on tiles, you’ll have to have your roof inspected to ensure it can hold the weight of the tiles, since they’re significantly heavier than shingles. If your roof is determined to not be able to hold tile shingles, you won’t be able to have them installed. For all your roofing needs in the Norwalk, CT area, trust the experts at JM Roofing & Siding. With over 15 years of experience under our belts, we have the knowledge and know-how to offer you the best experience possible. Give us a call today at 203-299-0716. If there’s one home maintenance task you should be doing (at least) at the start of every season, it should be a roof inspection. Every season brings with it new challenges for your roof — winter hail, spring rain, and blazing summer heat — so it’s important that you properly inspect your roof each season to ensure it’s in the best condition possible to keep you and your family safe. When you first go to inspect your roof, simply start by walking around the perimeter of your home and using your eyes to check for any damage. 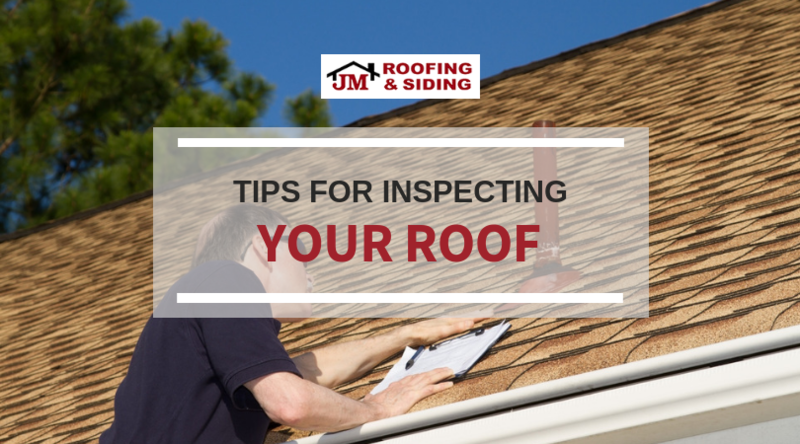 You’ll want to look at three areas specifically to ensure your roof is in good shape. Your shingles are susceptible to a lot of different types of damage during the year. During your walk around, take note of any areas where your shingles look loose, cracked, out of place, torn, or missing altogether. Those areas should be repaired as soon as possible so your home doesn’t suffer water damage or a critter infestation. Your flashing is the area when two slopes of your roof meet, typically near walls or your chimney. If the flashing is loose in any areas, missing its rubber cover, has exposed nails, or coated with cracked cement (a sign on improper installation), you’ll need to schedule a repair. Your gutters are a very important part of having a well-functioning roof. However, if they get clogged, the weight of the sitting water can cause your gutters to become loose, pull at the seams, and even weigh down your fascia. Make sure your gutters are in good condition and clean them regularly so water can easily flow off your roof. When you drive down the street, you probably see house after house with grey or tan siding. Talk about boring! Who wants to fit in when you can stand out? If you want to make your home stand out from the rest of the neighborhood, consider choosing a siding color that has a little flair to it and makes your home pop. Make your home look like a ray of sunshine! Yellow is a happy color that will brighten your street and give your home a classic feel. When you add a certain color of trim, such as white or light grey, you can give your home a modern, fresh feel as well. You can also pair yellow siding with a metal roof if you’re going for an even brighter look. Red siding looks great when paired with a dark roof. That combination paired with a white trim often gives your home a very colonial feel. Red siding can also pass for brick from a distance, so it’s a great option if you like brick but aren’t looking to spend the money on it. A rich blue can give your home a regal, modern feeling. Depending on the color trim you choose, such as white, your home can look very picturesque, like it came straight out of a movie. Blue is also a calming color, so seeing that when you pull into the driveway after a long day at work can put you in a better mood. For all your roofing and siding needs near Norwalk, CT, contact the professionals at JM Roofing & Siding. Give us a call at 203-299-0716 for your FREE estimate today. 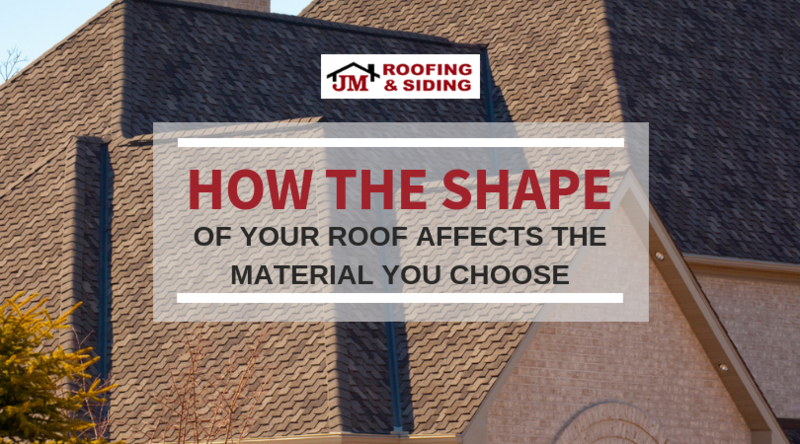 When you’re making as big of a decision as replacing your roof, one of the major choices to make is what material you’ll use. 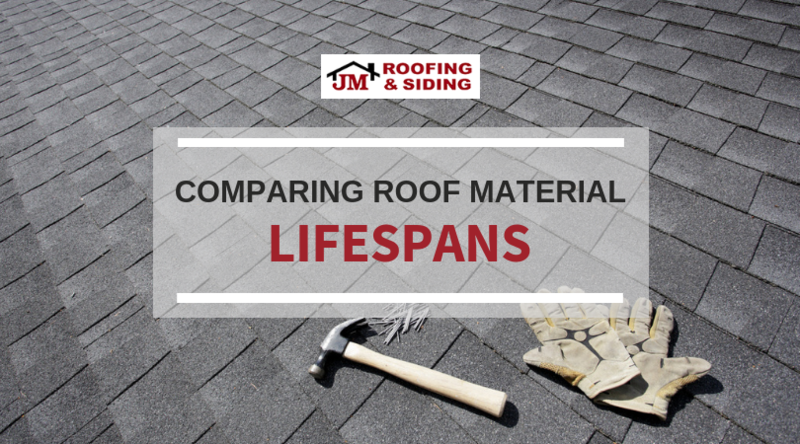 Since you likely want this to be one of the only times you completely replace your roof, you’re going to want to look for a material that has a long lifespan. Well, you have a lot of options. This is one of the most popular roofing materials on the market. Composite asphalt shingles have a relatively low-cost and typically last for 15 to 40 years, depending on how well you care for your roof, your area’s weather, and the level of quality the shingles are. Over the years, metal roofs are becoming increasingly more popular. Typically, metal roofs are made using steel or aluminum, but they can also use copper or zinc. Since they’re very durable, metal roofs tend to last about 30 to 50 years, some lasting decades longer. Wood shingles are made using thin pieces of natural wood and can give your home a fresh look. On average, they last about 25 to 30 years, but it’s important to note that they do require a lot of maintenance in order to stay in good condition. When your kids complain about a stomach ache, you listen and take them to the doctor. When your parents complain that you’ve only visited them a few times over the past few month, you listen and plan your next trip to their house. 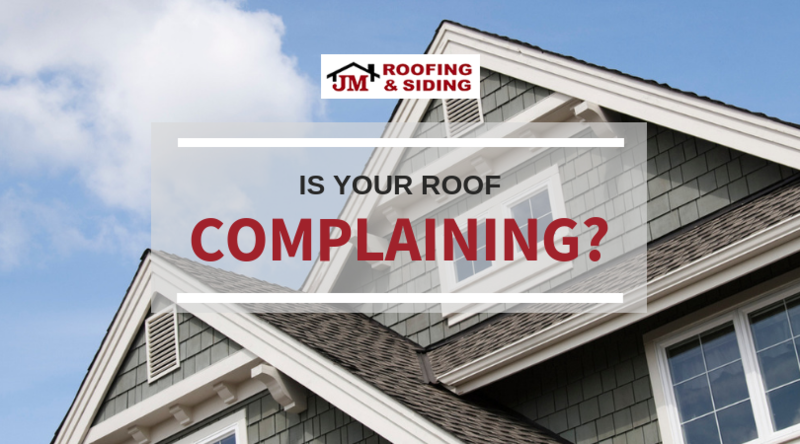 If you listen and respond to everyone else’s complaining, why wouldn’t you listen to your roof? It’s important to note if and when your roof is trying to tell you something so you can avoid bigger problems in the future. Then it is typically worn out. This is often signaled by damaged or missing shutters and often the result of harsh weather or time. While some repairs may be able to give your roof a little relief, extensive damage or too many missing shingles will require a replacement. Then it needs better ventilation and insulation. There should be several ventilation spots in your attic to expel hot air and a good layer of insulation between your attic and home, especially in the warmer months. Too much heat can not only lead to higher humidity, but all that hot air could also seep down into your home and make you feel uncomfortably warm. Then you have an issue with your gutters. If your gutters are clogged, rainwater can pool and pull your gutters down, causing your fascia and roof to sag. You’ll need to clean out your gutters and potentially repair your fascia and invest in gutter protectors to fix the problem. Just like the climate you live in can affect the type of roofing material you use, so can the actual shape of your roof. Not every material can be fitted to accommodate certain angles and slope of your roof while still looking uniform and being functional. It’s important to determine your pitch in order to then pick your material. These roofs have a lower angle and are typically seen on urban buildings or more modern homes. Several roofing materials are best for these pitches such as rubber membrane or standing seam metal. This is a common pitch for many residential homes and most often uses asphalt shingles. 4/12 to 20/12 roof pitches are a kind of middle ground for roofs since they are not too low or high-angled. These are higher-angled pitches that most often use wood or slate shingles. However, it’s important to note that some wood roofing materials don’t lock as well as other alternatives. When you’re making as big of an investment as a new roof, you’ll probably do your absolute best to avoid making any costly mistakes that could negatively affect the project. 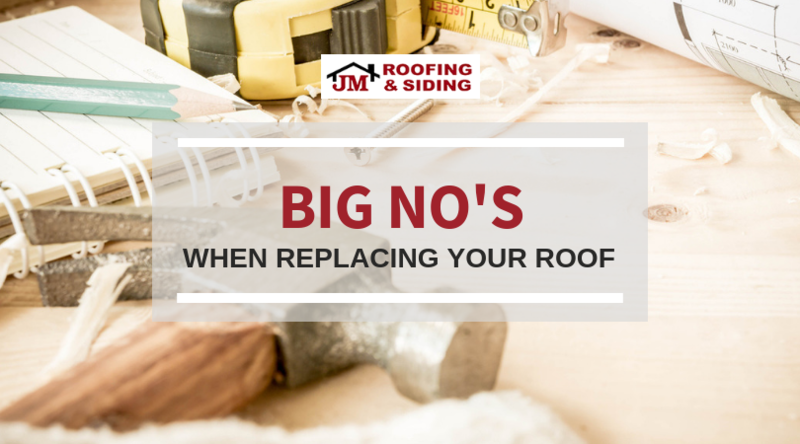 While there are plenty of things you should do when it comes to your roof, there are a few big “No’s” you should take into consideration as well. If you have experience with roofing or are just particularly handy, you may be able to handle doing your roof yourself. However, if you aren’t that great with your hands, don’t make your roof a DIY project. Trying to replace your roof without experience can result in improper installation and actually cost you more in the long run. You may think you’ll be able to save on costs by cutting out the middleman and buying your roofing materials, but that’s not always the best idea. A professional roofing contractor uses specific brands and materials for a reason — because they know the quality and worth of them. Buying your own materials means having to spend more time going through different materials and try to negotiate the best price. Hiring a professional cuts out all the hassle and often gets you a better price. While you may love the idea of having a skylight, they typically can’t support too heavy of rainfall and can allow for water to seep into your roof and cause leaks. Sometimes, certain products or roof features can actually cause more harm than good and run up not only your initial costs but maintenance and repair costs down the line. When you’re making as big a decision as what is going to protect your home and family from the elements, you should ask any and all questions that come across your mind. After all, the more questions you ask now, the less confusion or misunderstanding there will be later on. 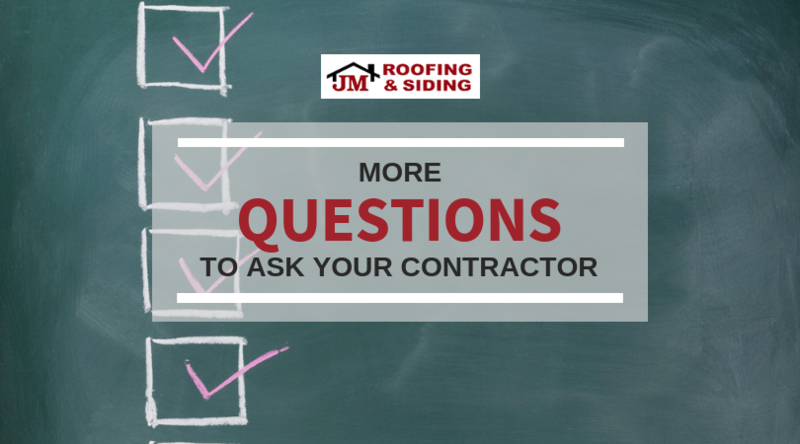 Make sure you ask your roofing contractor these questions. How local is your business? While you don’t necessarily need a contracting team close to home, it definitely helps! When your contractor is local, you not only have a team who knows your area and its weather, but it can also be cheaper. If your contractor has to travel (with all the materials) from far away, you may end up having a higher fee. Who, exactly, is installing my roof? Is you contractor and his or her own team installing your roof? Or are they outsourcing a team to get the job done? It’s often better to hire a contractor who has and uses their own employees, so you know exactly who will be working on your roof. Who is handling getting the necessary permits? Will your contractor require you to go to your local city hall and get the necessary building permits or will they take care of things for you? It’s often better when your contractor will take care of that for you — one less thing to worry about on your end. How will you ensure the safety of my home and family? The last thing you need is for something to fall off your roof and injure a family member as you’re leaving the house in the morning. Speak to your roofing contractor about what steps they will take to ensure your home and family will be unharmed. As the winter weather continues to get worse and worse as the years go on, it’s getting harder to protect your home against the elements. One major issue that comes about during winter is ice and freezing. 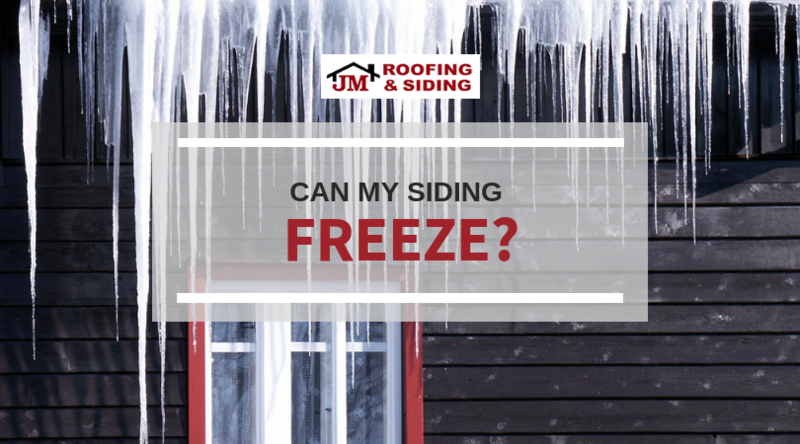 Sure, you know that your driveway can freeze over when the temperatures drop, but did you know that your siding can freeze too? As water gets underneath fiber cement siding, it can freeze, causing the material to expands and crack in the process. Once the water melts and the fiber cement is no longer frozen, it can continue to crack and break as the material relaxes. Wood siding needs to be taken care of to preserve it normally, but during winter, it requires a little more attention. If you don’t keep up with painting and sealing, water can soak into your wood siding, causing it to freeze, warp, and crack. Vinyl siding is often installed a little loosely so that it can handle the changing temperatures outside — it expands and contracts with outdoor weather. While it’s pretty good at standing up to the cold, it can be more prone to freezing and crack in winter if the temperatures really drop. If you opted for engineered wood siding over the traditional material, your siding may have a better chance at holding up in winter temperatures. Engineered wood siding doesn’t freeze as easily as other siding materials, so you won’t have to worry about much damage. If you’re like most people, you probably don’t pay your windows much mind, aside from choosing the curtains that cover them. However, your windows play an important role in keeping your home comfortable and safe from the elements. 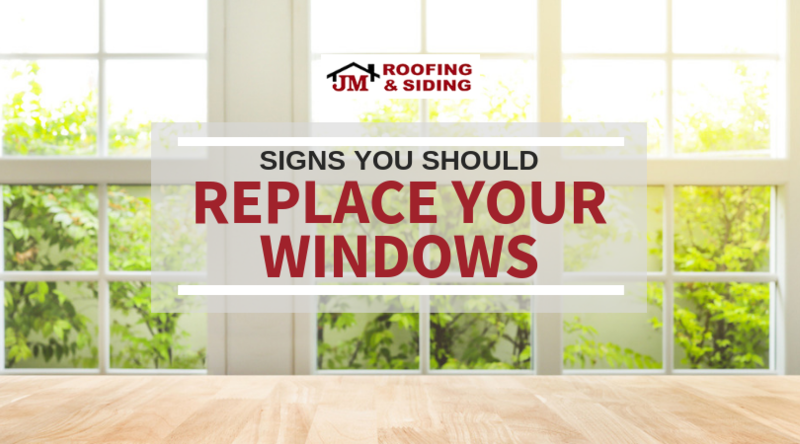 There are a few signs you should recognize that signal when you should replace your windows. The seals around your windows can wear down after a while and allow for drafts to enter your home. While a slight draft once in a blue moon isn’t a major problem, if you have drafts coming in from multiple windows all the time, you should look into getting replacements. Overly drafty windows seriously disrupt your home’s comfort and can raise your energy costs. If you have to use a lot of strength to pry your windows open or get them to shut again, you should really look into replacements. Not only can they prevent your home from getting fresh air if they’re hard to open, but if they’re also hard to close, they may be allowing outside air into your home and not creating a proper seal like they are supposed to. If you have windows that open and close vertically and they constantly fall, that’s not only annoying, but it’s not safe either. If your windows won’t stay in place when you open them, you run the risk of their closing on someone’s hand or on your pet’s paw, so you should replace them. If excess moisture has caused the wood panels of your windows to warp or rot, not only are they not able to properly seal, but they run the risk of mold growth. Any windows that have extensive water damage should be replaced. If you notice water damage on your windows, it could be caused by problems with your roofing or siding. 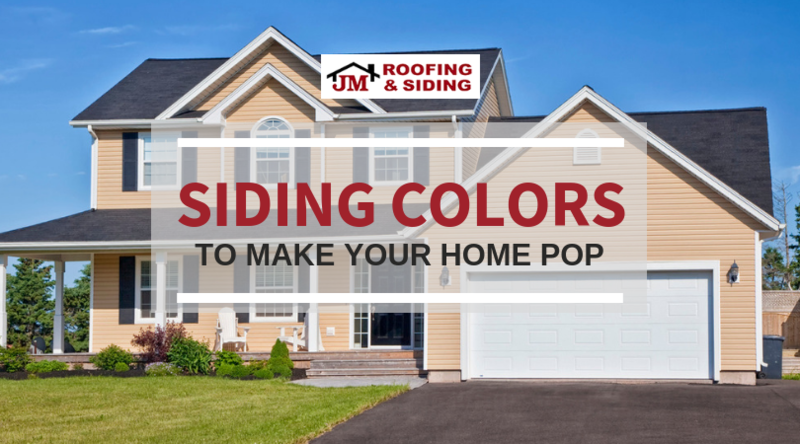 Ask the experts at JM Roofing and siding for help keeping your home safe from the elements.